Hey guy, as you can see this is my first post, so go easy on me if I miss something. After several hours of racing we are losing power. The problem presents itself over several laps with diminishing RPM possible. Runs great, then suddenly won't rev past 6500, next lap 6000, next lap 5500, etc. The spark plugs look super lean (paper white), but we don't have a wideband plugged in so no idea what the AFRs are. Not backfiring much, just no power. Ready for the twist? Turning the ignition off corrects the problem for a short time. The longer the car rests, the longer it can go without losing power. In the final laps of the last race, our driver was getting the symptom, so he killed the master power going down a hill and flipped it back on at the bottom and was fine for the rest of the lap. I think something is getting heat soaked and failing. It is hard to replicate the problem outside of an endurance race because (shocker) we don't have unfettered access to a race track or dyno for hours at a time. We have low impedance injectors and the OE resistor block. Stock N326 ECU. Also, we backed off the tension spring on the air mass sensor three clicks on advise from a mechanic. I will be changing that back to the factory setting in short order. I will be checking all of the engine grounds and the coils, and checking that our new fuel pump is making the right pressure. I am considering switching to high impedance injectors as I suspect the resistor block was not designed for 7-12 hours of constant use. 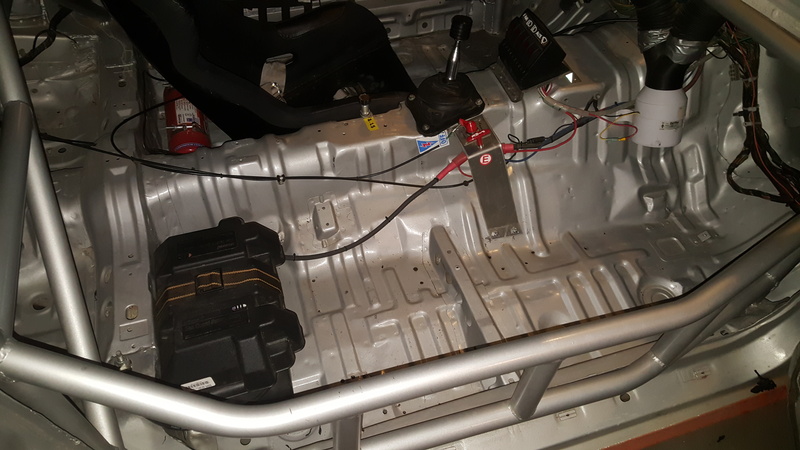 Since we are done racing this year, I might add a wideband O2 and fuel pressure gauge to the dash. I don't think there is anything mechanically wrong with the motor. We rebuilt the motor before the first race. Oil temps are around 220 (full synthetic measured in the pan). We are running premix 2 oz per gallon (Swepco 313) in 87 octane gas. Water temp stays below 200 (put a sensor in the line that went to the throttle body, looped to the port in the rear iron). Getting 80 psi oil pressure, cold and hot starts are no problem, idles at 1000 (nothing weird). Not losing water or oil, no leaks, no smoke, no funny noises. What could cause this power loss after several hours of racing? Why does cycling the power alleviate the problem? If you know any endurance racers who use fuel injection please put me in contact with them. PS: this is the first rotary car I have worked on and I don't have a good understanding of how all the sensors on this motor work and how they impact the performance of the engine. I don't even know the acronyms. We took everything off the motor we could and even removed the port inserts and actuators (yeah, not much power down low). I am going to try running it with the secondary injectors unplugged (wires, not plumbing) and see if it mimics our race experience. If not, I will move to ignition troubleshooting. Fuel pump is probably overheating. Shutting the ignition off lets the pump cool off slightly. Big problem I have with my external fuel pumps, exhaust heat and radiator-flow heat in grid make me lose a lot of pump capacity. The fuel tank itself gets very hot, too. A naturally aspirated rotary will run extremely well with lean mixtures right until the point where it is too lean to ignite. I'd want to get those oil temps down to 180 or so if at all possible. At least on my engines, power seems to fall away drastically once oil gets past that point. Measured in the pan. I'm not thrilled about coolant much over 180 either, but I'd address the oil first. Address the fuel issue I suspect you have, and you may find your oil temps come down. Last edited by peejay; 10-24-16 at 08:11 PM. I'd absolutely get those oil temps down, I agree with that 100%. I don't like to see higher than 220 going into the engine, which probably correlates to around 180 in the pan. Oil temps are very important for rotary engine longevity, much moreso than piston engines. i was thinking fuel pump too. although a second thought is the master power switch, those things do go bad. i wouldn't worry about water temps at 180, but if the oil were cooler that would be better. Do the NA RX-7s have a fuel pump kick down resistor in the fuel pump relay like the TIIs? I would try bypassing that with a new relay if so. Thanks for your input. I will rig up a fuel pressure gauge and keep an eye on it. There is a test day at Oregon Raceway Park on Nov 5th, so maybe we can get more data then. 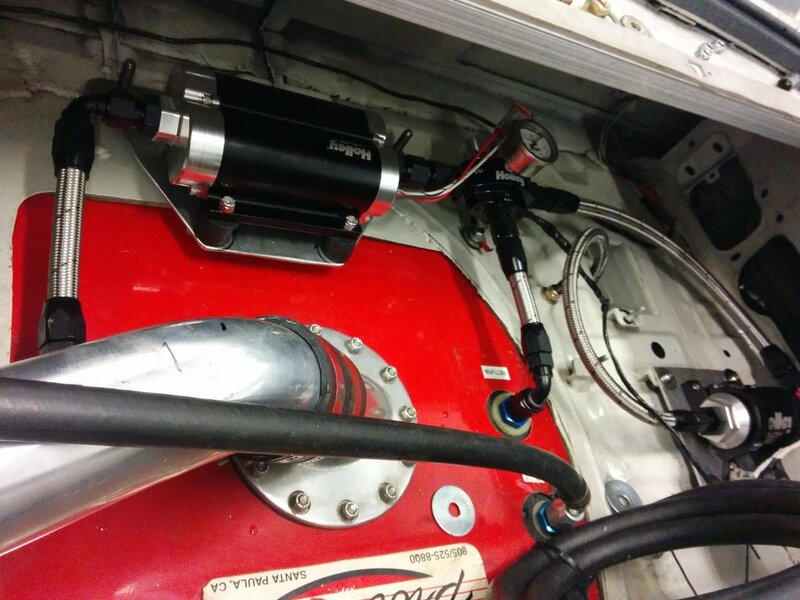 If you study what fails on endurance racing cars the number one problem is fuel pumps. Just replacing the pump with another stock replacement does not necessarily completely fix the problem, back when I was using Airtex pumps I had to go through 4 that failed quickly to finally get one that ended up living for a long time. Now I have what should be a much better system with 2 separate fuel pumps in a single housing and a switch on the dash so I can swap them if one fails, of course Murphy’s Law and last race the pump selector switch itself failed. As for oil temps I would hate to admit how high mine have been, but hopefully I have that taken care of with a second oil cooler. Very interesting, we experienced the very same issue endurance racing our gsl-se. I mean exactly. End of long weekend, car starts slowly losing rpms. 1. Fuel temp issue/ dying fuel pump. We started noticing when we came in to refill the car you put in a full load of cool fuel, car ran great. As the stint goes on car slowly starts to lose power, then worse and worse. 2. Master kill switch. I believe this was one of our main problems. I'm serious, change it. We chased down so many gremlins and never thought of this. We were at VIR a couple years ago and the kill switch got so hot it started smoking and melted. Terrifying. Great to hear someone else had the same problem. I haven't had the car back out yet, but when I do it will have a fuel pressure gauge for sure. I am using a Longacre master kill switch, fresh out of the box. Battery has be re-positioned to minimize cable run. I don't think I can do better on a kill switch install. I will put a hand on it next time we run the car and see if it is becoming a resistor. Great to hear someone else had the same problem. oh we've done both too. I took the RX-7 out to a late season rallycross in order to just drive it gently and renew my Mazdaspeed membership so I can buy parts over the winter. Drive gently. That idea lasted until I clicked the harness on! I didn't get to finish all of my runs. The reason why is relevant to this thread. This is a persistent problem I have at THIS site, I think because of the long hill, susprisingly grippy surface, and generally low car counts making for a fairly high power:time ratio. Try another switch (the longacres are known to be hit or miss) if it turns out it's not the problem it's something you should carry as a spare anyway. Also, don't rely 100% on a pressure gauge as an overheated pump could well be putting out OK pressure but not the volume you need. The pressure comes from volume. If there is insufficient volume, pressure will drop. It doesn't have to be all or nothing. Fuel pumps have a curve of pressure over current draw. If the pump gets hot, current draw goes up for a given pressure, volume goes down since the pump can't quite do it anymore, and it finds a new equilibrium as the pressure falls off which reduces the amount of current needed. So it isn't necessarily an all or nothing affair like the pump just dying 100%, or running out of flow. Last edited by peejay; 11-01-16 at 04:59 PM. this one time at the 25 hours of thunderhill, our car had a fuel cell, and since we had to put it together at the last minute, we had problems. 1. we didn't wash the foam, so we had little chunks of foam clogging everything, filter, injectors etc. 3. bonus! put beads on your radiator pipes. we popped it off and cooked the engine like 90 minutes in. we finished, but it was a good thing we were in fixing the fuel pump, because it needed water too. 3a. bonus bonus; our pro built engine had all the valve keepers mixed up (among many other things wrong), so all the pitstops and running with no power probably kept it from falling apart. This thead has inspired me to try running 10ga wire directly to my pumps with a stout relay. Maybe the problem is the stock wiring can't handle the current draw of two really hot fuel pumps? Also, this post has me thinking of the song "My Humps" with some words changed. So not everything is good. This thread is maybe the perfect rx7 endurance racing thread. It perfectly encapsulates the ludicrous frustration. I just think it's funny, I know the exact situation of the original poster. That horrible sad feeling when your at Watkins Glen on the back straight and your car just won't go over 6,000 rpms. So you nurse it, and pretend it isn't happening. And then the front straight... 5,500 rpm. And then the back straight, 4,500. So you slink back into the pits, waiving everyone in their stupid BMWs past you. Sorry guys it's over. Then you proceed to rewire your entire car, send your injectors across the country to be cleaned, change the fuel pumps, change the filters, inevitably find and fix a random vacuum leak. Read again, but still not understand what the BAC valve does. @Peejay- I have since put in a 3rd gen alternator (100 amps I think?) but man, running with the original first gen alt at like 60 amps I learned to love relays. They make a huge difference. Relays are great, I used to be an engineer at a company who built fuel pumps and we always recommended relays. Those pumps were 400gph drag racing monsters that drew 20-30 amps and couldn't run for more than 5 minutes without overheating, people weren’t used to pumps that powerful back in the 90’s when I worked there. At the risk of a thread derail here is another losing power question. Last weekend we were running great at AMP had fast lap of the race on Saturday and second fast lap on Sunday. We came in for a pit stop to put our 3rd driver in, the car was running great but when he started the car to go out it sounded off and he reported no power. Checked and no compression on the front rotor, does anybody know how you can lose apex seals when the car is sitting in the pits? Regarding losing a rotor, it's amazing how well an engine can run "hurt" before you shut it off. I've had a few occasions where it was still running, and running great at higher RPM, but I didn't dare let it idle/stall because I knew if it shut down, it wouldn't ever start again. 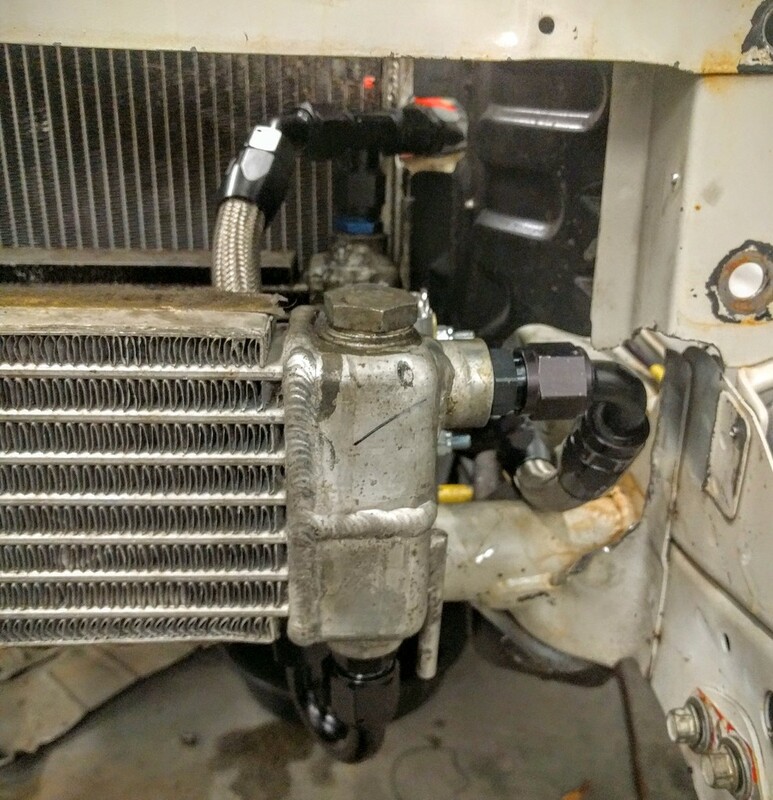 OK, after replacing the Airtex pump with a Bosch pump from rock auto, insulating the supply and return lines that run over the engine, and putting a thermal blanket between the muffler and the gas tank we ran for 7 hours straight, 13 hours total last weekend and no issues. We put fuel pressure and AFR gauges in the car as well and everything was nominal (35-45 PSI fuel pressure, 10.5-14.0 AFR). So, I am calling it fixed. We ran in B class with Lucky Dog Racing at the Ridge again, finished 4th in class on Sunday on the same lap as the leader. Not bad for our third race as a team. Check out Atomic Wankel Racing on FB for more details. Thanks for the update with fix!